Having fun re-purposing antique silverplate – especially love Art Nouveau floral patterns! Recently found some beautiful Gorham and R. Wallace sterling spoons and converted them to wearable pendants. Tuesday, April 11, United Way Community Baby Shower event Artisan Show @ Reflections Hair design of WNY Inc. The Market Place will be located in Wick Lobby from 11 am to 1 pm. Busy getting ready for these two fundraisers designing and fusing glass for jewelry and my stainless steel bottle stoppers. Time to fire polish those grinding marks away! 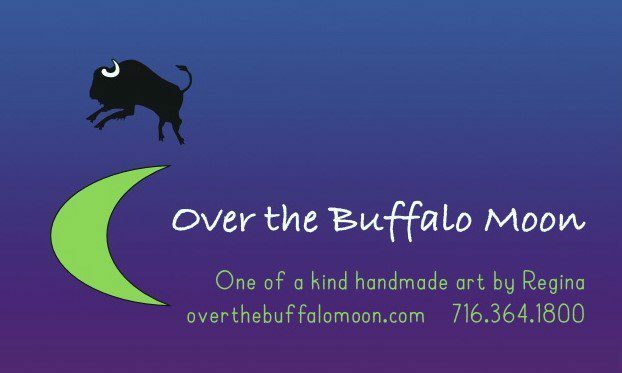 Black and white and Over the Buffalo Moon!